(HUDSON, N.Y.) – Renowned landscape painter Stephen Hannock will take part in Colloquium 2018: Making Art, Making Artists: Mentoring from Cole and Church to Today in the Arts Center Theatre at Columbia-Greene Community College (C-GCC) on Thursday, March 1, at 7pm. The discussion will be moderated by Yura Adams, an artist and art educator currently serving as an adjunct member of the fine arts faculty at C-GCC. The discussion, exploring the role of the cultural environment of the Hudson Valley in supporting and mentoring artists, will also include independent curator Carrie Feder. Stephen Hannock is an American painter known for his landscapes –– flooded rivers, waterfalls, and wide vistas among them. 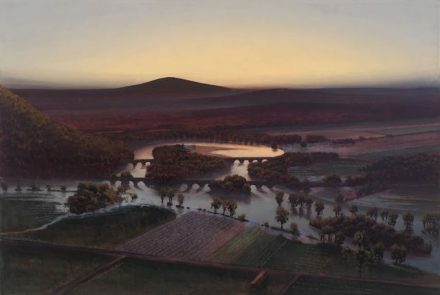 Some of his work is thought to be inspired by the Hudson River School; “The Oxbow of 2000,” for one, was inspired by artist Thomas Cole and currently hangs at the Metropolitan Museum of New York. Hannock also earned an Academy Award for Special Visual Effects in 1999 for his contributions to the film “What Dreams May Come,” and his work has been privately commissioned by chef Tom Colicchio for his restaurants Gramercy Tavern, Craft, and Colicchio and Sons, and by musician Sting for a work slated for donation to the Tate Modern Museum of Art in London, to name just two such projects. Carrie Feder has an extensive background in art, historic preservation, and environmental activism. As a trustee at the Thomas Cole National Historic Site, she spearheaded the effort to research and recreate the historic interiors and is part of the team that created The Parlors, an immersive experience where history meets multimedia technology. Feder curates art exhibits that juxtapose historic artifacts with contemporary art on such topics as Immigration, the Dutch and the Mohicans, and most recently A Declaration of Sentiments: Reflections on the Centennial of Women’s Right to Vote in New York State at the Athens Cultural Center. Colloquium 2018 is co-sponsored by C-GCC, Olana State Historical Site, and the Thomas Cole National Historic Site.